As part of the shortage of time and the increasing realization in my philosophy of life what in the relevant literature warningly describes as mortality, I have adjusted my writing plans in line with these realities. After an initial focus in my third career on the building up of a small advisory firm, on teaching and the enjoyment of new freedoms, writing is taking on a new importance again. In this way I had written in my seven working stays as a Visiting Professor at Harvard Law School the essay collection A Timely Turn to the Lawyer? 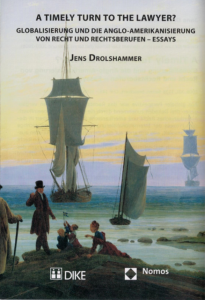 Globalization and the Anglo-Americanization of law and legal professionals – Essays – completed in 2008. Die Internationalisierung der Rechtsausbildung und Forschung zum International Lawyer und International Manager – von knowledge to activity: eine «Kür» für wenige oder eine «Pflicht» für immer mehr? Introduction: On the Way to a Globalized Practice of Law?! Managing the International Law Firm: Nuisance or Necessity? The Future Legal Structure of International Law Firms – is the Experience of the Big Five in Structuring, Auditing and Consulting Organizations Relevant? Currently I’m considering to write a book based up on the last conceptual and methodological essay in English. 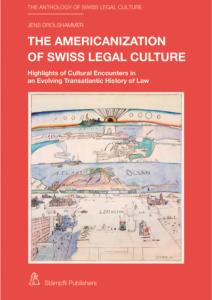 I also work with fellow professors from the Legal Culture Club in a long term project of an Anthology of Swiss Legal Culture in English. In 2005 I have written the following texts: “Recht, Rechtsberufe und Rechtsreputation als Faktoren der internationalen Wettbewerbsfähigkeit der Schweiz, das “Legal Black Hole” der zugrunde liegenden Rechtskonzeption” (“Law, legal professions and legal reputation as factors in Switzerland’s international competitiveness, the legal black hole of the underlying concept of law”) in the Festschrift “25 Jahre juristische Abschlüsse an der Universität St. Gallen (HSG), Rechtliche Rahmenbedingungen des Wirtschaftsstandortes Schweiz” (“25 years of legal graduation at the University of St Gallen (HSG), Legal framework conditions of Switzerland as economic centre”), “Risk and Response, zur Notwendigkeit eines strategischen Umgangs und Catastrophic Risks in Grenzbereichen technologischer und wissenschaftlicher Entwicklungen” (“Risk and Response: on the need for a strategic approach to catastrophic risks at the margins of technological and scientific developments”) in the Festschrift for / Hommage à Jacques Santer, and together with Nedim Peter Vogt “English as the Language of Law” and the 2005 “Swiss Law Bibliography”, in LeGes- Gesetzgebung und Evaluation. After no further progress has been made in the development of rote learning as a way of abjuring knowledge, it remains to be seen how, in what sequence, in with what temporal intervals this series of texts will manage to be written. 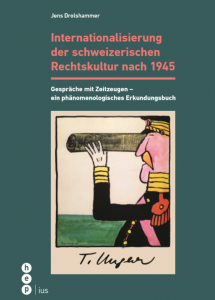 After retiring in 2009, in addition to his consulting activities, the focus was on the founding of the “Anthology Swiss legal culture” project and the “Oral History” project on the “Internationalisierung der schweizerischen Rechtskultur nach 1945”. All these publications will again predominantly address subjects which, although they are relevant to the practice of law, are not dealt with by practising lawyers for reasons of lack of time, and which are not regarded as academic subjects at university level because they are relevant to the practice of law. What we have to do is to open up a wide field of critical consideration of the “International Legal Process” with a number of individual contributions, on a step by step basis and in a variety of academic and journalistic publications. With this in mind, I will not be adhering to the traditional nomenclature and classification of publications employed in an academic context nor to what the academy would regard as suitable qualifications for the production of so-called academic work. Later on, it will also become important to include journalistic publications, particularly those that appear periodically, and also the leading daily newspapers as well as other kinds of journalistic publications, in a sophisticated and not over-simplified presentation of legal issues with an economic point of reference and with special consideration being given to the transatlantic perspective. I therefore look forward to a certain amount of journalistic newspaper column and essay writing activity in the future, initially (should the right circumstances arise) in the Neue Zürcher Zeitung; other media may follow. Equally, it is important that the significance of law and lawyers in the globalized economy is also described in those media that tend to set the agenda for intellectual issues in this media driven and “virtualized” reality. It would be pretentious to limit oneself to the perfumed hand of scholarship when the “battle for justice” is being waged in other knowledge and communication based contexts. On reflection, however, it has become clear that contrary to attempt to be in the public eye through publication, it is the act of off the record speech in private during the encounters in “The Salon” – often about the very same subject – has for the moment taken on the more significant role in terms of shaping of my life. Verba volant – script manent?